Are you ready for some hawking? The time here! For many of us this is the time of year we most enjoy. After a long hot summer, the cooler weather has finally arrived in most parts of the country. Things are about to get serious! Before I get too far into my message I just want to apologize for the delay in getting this email out, there are much more important things afoot. I'm currently attending the Saskatchewan Falconry Association's (SFA) annual field meet in the little town of Swift Current , Saskatchewan while we all celebrate the SFA's 60th anniversary. Think about that, 60 years of organized falconry, what a rich history. Years ago Vice President Geleynse and I talked about NAFA sponsoring a field meet north of the border and here we are, this was a long time in the works. A lot goes into organizing a successful field meet, planning and scheduling a meet with a national border adds whole other layer of complexity. Remembering, we are all just a bunch of volunteers, I'm continually amazed at what we are capable of doing as a group. Paddy Thompson, Gail and Rick Bryne, Larry Going, Nayeem Islam, Dale Guthormsen and Martin have done an incredible job organizing what has already been a fantastic event. Folks, it's not too late to buzz over to Swift Current and see for yourself. In all honesty, I'm thoroughly impressed by the quality and level of falconry, the dedication to the sport, and the drive to get the best out of their birds. It is a close-knit community where everyone takes the time to ensure you have a chance to fly your bird, sometimes several times a day, or, as a guest, get out to watch some fantastic falconry. I see now why people like Kent Carney, Clee Sealing, and others come here year after year to enjoy the great falconry and even better camaraderie. This is what falconry is all about, I just wish I was flying a bird. Hopefully a quick trip to South Padre Island this weekend will help address that issue and next time I can bring a bird or two to fly. NAFA has never nor will it ever tolerate, condone, or accept any form of harassment or abuse. 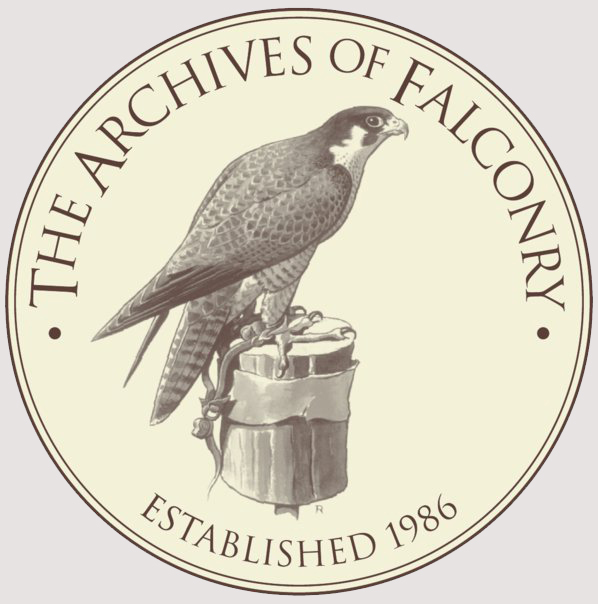 As falconers, members of NAFA, and someone dedicated to ensuring that falconry remains a respectable endeavor that is admired and continues to be held in high esteem, we should all be committed to promoting appropriate standards of conduct and perpetuating the ethical behavior associated with the cultural heritage and sport of falconry. 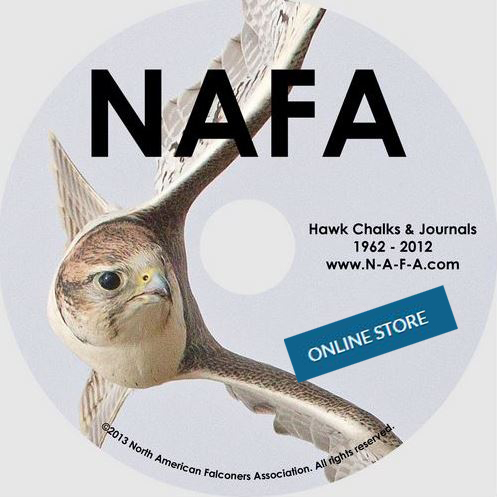 As NAFA members, we agreed to abide by a code of conduct and are responsible for respecting the dignity and rights of all others, including other falconers, apprentices, and sponsors alike, and all others who may simply be interested in falconry. We are one big happy family, with a crazy cousin or two. Like most families, we'll have our differences, but that's ok, it's what makes us great. Having a code of conduct or ethics policy is meant to help maintain a welcoming and respectful community where we respect each other while recognizing and respecting our differences. It shouldn't be rocket science, treat others as you would like to be treated. In the wake of the #MeToo movement that has been rolling across social media, plastered across the front pages of most newspapers, and has been the lead story on most news channels, I believe we should all take a minute to reflect on how we engage with others. For the same reason I believe NAFA has a duty and the same responsibility to our membership and to falconry, thus we will be revisiting our ethics policy and code of conduct to make sure we are doing all that we can to maintain a respectful, safe, and welcoming falconry experience. 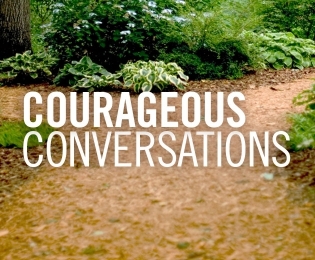 I believe NAFA and falconry are worth having these courageous conversations while deciding if we need to modify or improve any NAFA policies. NAFA is not alone, many associations are facing the same challenging questions about how to set the bar for acceptable conduct, enforce fair policies, and promote a positive and respectful membership community. Now is an especially good time to reexamine our written policies and the climate of our association. In an effort to better understand the overall climate of our association, remain well informed, and make appropriate decisions, especially issues that directly affect woman in falconry, I have asked Jamacia Smith to chair the NAFA Woman's Working Group. I've asked Jamacia to explore ways to make NAFA a better and more proactive club. As the falconry community becomes more diverse NAFA needs to be better prepared to evolve and change with the times, where needed. These are exciting and challenging times and I look forward to improving the overall NAFA experience. 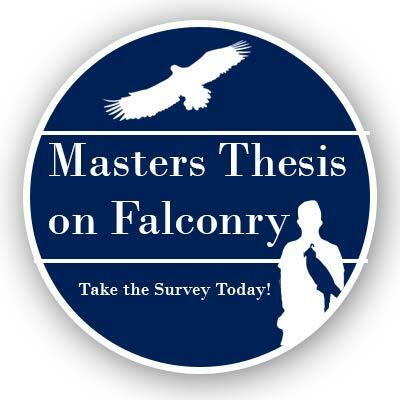 A fellow falconer and graduate student is working on her master’s thesis and needs your help! The survey should take about 20 minutes to fill out and focuses on how you feel about your raptor and what behaviors you have observed in your raptor. 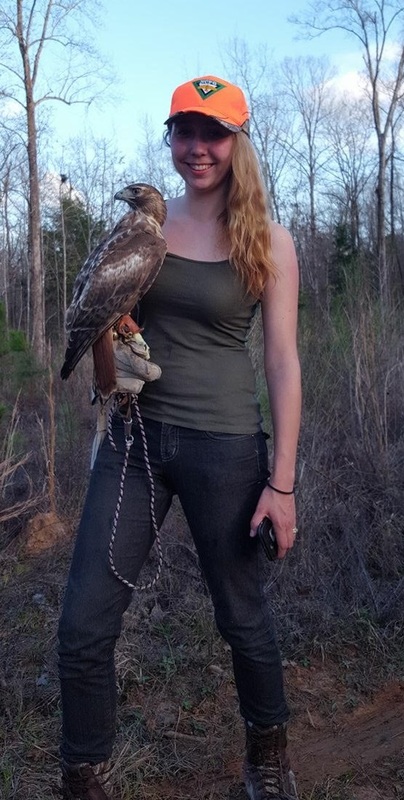 If you are a currently licensed falconer age 18+ in the United States, Canada, or Mexico, please consider taking her survey. 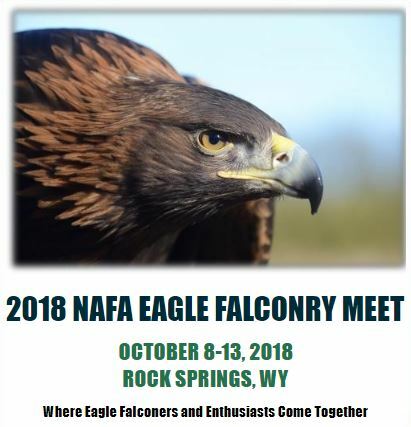 The 2018 Eagle Falconry Meet gets kicked off in a week in Wyoming. It's not too late to make plans to attend. They'll even welcome walk-ins and late arrivals. But the longer you wait, they may run out of Meet t-shirts and Falconry Traditions game bags before you get there. This year promises great falconry and fellowship. Make sure you come prepared for Wyoming weather. It isn't always 70 degrees and sunny. While rain can be rare, wind and blowing snow are not. There will be plenty of hunting opportunities each day, and activities planned each evening. There will be Door prizes each evening, and a great auction featuring hoods by premier hoodmakers such as Ken Hooke, Clay Smith, Ray Gilbertson, Jim Nelson, Gerald Geiger, Natasha Leong, Bill Barbour, Eric Tabb, Larry Ray, Jason Reid, and others. Marshall Radio is donating one of their GPS systems for the auction. Don't miss it. Rock Springs, Wyoming. October 8-13. We are just a little over two months away from this year’s NAFA field meet in Lubbock, December 2nd-7th. Remember that you have just over a month to pre-register and get the early bird registration prices. This year’s raffle coordinator is Krys Langevin. If you would like to donate to the raffle this year, please get in touch with Krys at 817-528-9743 or frootdog@yahoo.com. NAFA depends on the generosity of members and vendors to have a good raffle that helps fund all of our other operations through the year, so any donation is welcome. Our vendor coordinator is Mario Nickerson. If you would like to sell items in the vendor space, please contact Mario at 817-751-5775 or Dirthawking@yahoo.com. As some of you saw on our official public Facebook page, Chris Comeaux has graciously offered to do the shrimp boil again this year; hopefully, you can make it to what is always a fun event. Brandi has been working hard on procuring meet shirts, pins, swag and all the little details leading up to the meet. I’ve been doing some land acquisition and am proud to report that we have already secured about 2500 acres of land to hunt. I’ll be making several land acquisition trips to the area in the next three months so look for updates as we get closer and into hawking season. As always, if you have any questions about the meet please feel free to contact either Brandi (940-507-0333) or me at 817-575-7256 or croelke@uta.edu. As always, let’s hope for rain. Two very important action items! Please consider helping by participating in NAFA's conservation efforts. Below are two short messages from Conservation Committee Chairman Nate Bickford. Survey - Folks, this is important. Please take a few minutes over the holiday weekend to complete Conservation Committee Survey - As promised the Conservation Committee has put together a short survey to help guide NAFA's future efforts . Hi! 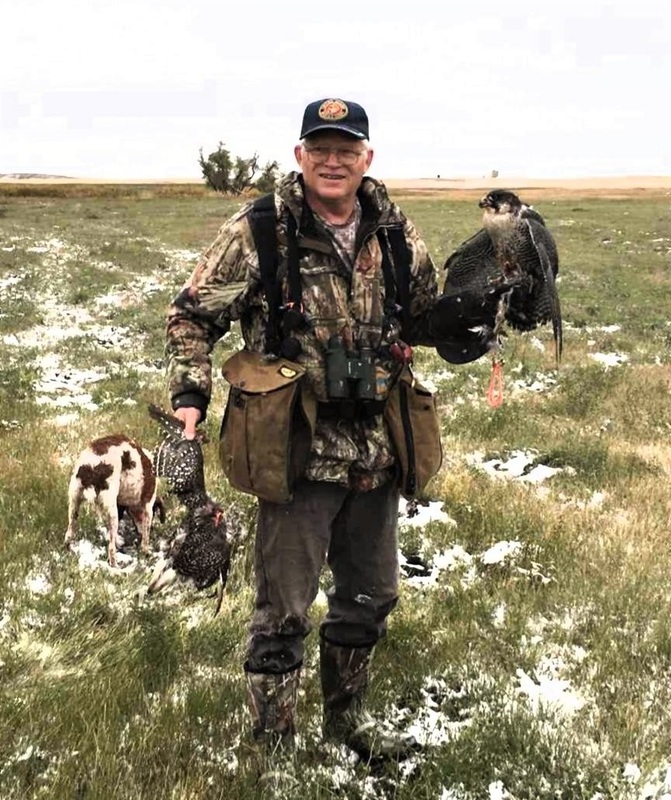 My name is Nate Bickford, I am the Chair of the Conservation Committee and a faculty member in the Department of Biology at the University of Nebraska Kearney (Nebraska, USA). Conservation is an important topic for any hunting group. This survey has been prepared to gauge the general memberships’ interest in various parts of conservation and how it best relates to you. As part of this research I would like to conduct a survey (by completing the survey via the emailed link below). The survey should take 15 Minutes. Participants must be over 18 years old. Participating in the study is voluntary. Conservation Through Participation! Please participate and help be a part of NAFA's important conservation efforts. The survey will help us focus our future efforts. As an organization, communication and sharing of timely information is important. 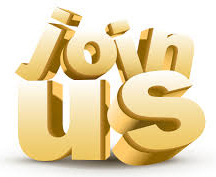 To better facilitate membership engagement NAFA is rolling out a new member's online community that we are fondly calling the 'Online Weathering Yard'. To access this new community simply login in using your member ID and password and you'll be presented with the new NAFA Weathering Yard community pages. 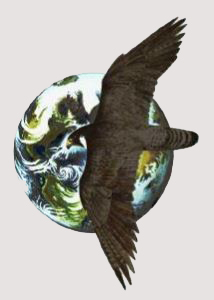 In time it's our hope that members will use this new and exciting tool to reach out to other falconers either in their own backyard or around the world. 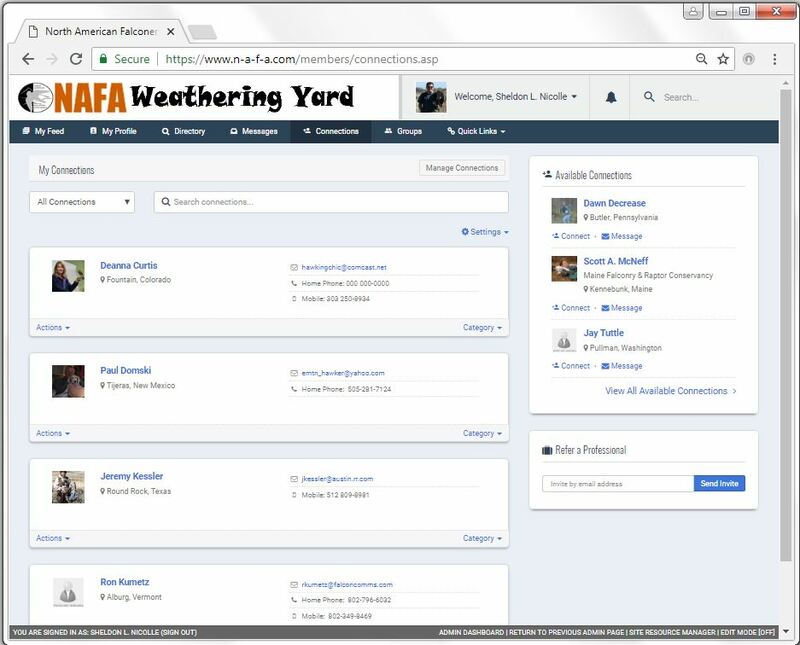 We are pleased to announce that the new NAFA Weathering Yard Online member community is now available on your desktop or via a downloadable app called SocialLink. You will be reading more about thi this new community and app in the coming days and weeks. You can expect a brand new way to easily connect with fellow members, share information across the NAFA online network, register for meets, pay your membership dues, and manage your membership preferences. Finding member information and updates has never been easier thanks to this exciting new enhancement! To login to the app, you use the same membership login from the NAFA website. We encourage you to stay logged in to the app for easy access, however, if you do choose to sign out the app will remain on your mobile phone or another device. If you have issues logging back in, clear the cache on your phone. This is a membership directory on your phone! 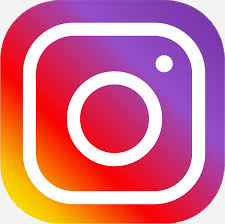 Make friends, manage groups, post pictures, ask questions, this is a true membership engagement tool that I hope you will all take the time to learn about and enjoy. *This community and app is available to current NAFA members only and requires a member login to access. To become a member, click here. More to come!!! Stay Tuned!!! Finally, in closing......... Always remember...... "Our differences as falconers make us stronger, but falconry is what unites us! Falconry makes us family!" Is your club missing from the list? When I first started in falconry, I was encouraged to join just about every state club that was anywhere near where I lived and NAFA too. I'll admit that, at first, I wasn't sure I wanted to join "just another club." But I did end up joining after my first season and it was one of the best recommendations my falconry friends ever made. What I've found in being a member of NAFA has surpassed even the best expectations that I could have had in joining. 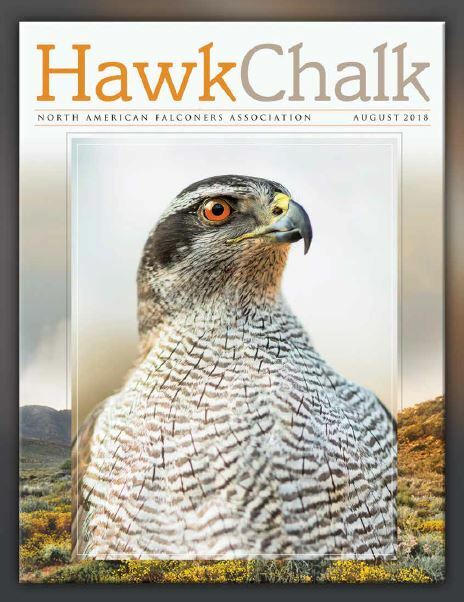 From monthly updates about what's going on in different states and countries to the quarterly Hawk Chalk which actually has me looking forward to getting the mail, there's tons of information being shared in multiple avenues. Then there are the people. Holy cow, what do you say about such a diverse and interesting group of people who can all get together from around the country and enjoy an entire week of hawking? 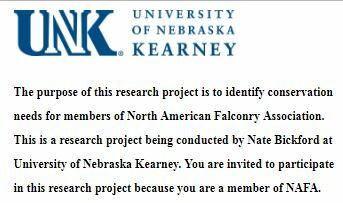 I've made so many awesome and passionate friends through attending last year's meet in Nebraska and then through the incredible trip to the International Falconry Festival in Abu Dhabi that NAFA was kind enough to select me to attend as a representative. There are simply no words to describe the feeling of not only hawking together but being able to share hunting stories "around the fire and a beer" with others who understand exactly what you mean when you describe a favorite hunt. Not only that, but even if you don't talk until the next meet - you can just pick up exactly where you left off with "so what are you flying this season?" Even though I've only been a member for a short time, I'm so thrilled to be a part of NAFA. Being a member isn't just about being a member of another club or organization simply to be a member. It's about the people, the experiences, and the incredible birds we are blessed to fly every season.